Our campus was built in 1916 to house Little Rock College until it closed in 1930. From 1930 to 1967 St. John Home Mission Seminary was located at this site. In 1968, the campus was renamed St. John Catholic Center and became the home of the offices of Diocese of Little Rock. Today it also serves as a retreat center and residence for retired diocesan priests. To learn more, go to History of St. John Catholic Center Visitors may receive directions and information at the reception desk located on the ground floor of Morris Hall, the main building on the campus. Byrne Hall — houses the executive offices of Christopher Homes of Arkansas and Arkansas Symphony Orchestra. It was named for the diocese's first bishop, Bishop Andrew Byrne, who served from 1844 to 1862. Dining Hall — includes a kitchen, dining room and small meeting space for diocesan staff and groups using the campus for meetings, workshops and retreats. Originally built as a gymnasium, this building has had different uses through the years, including serving as a daycare. Since 1995, it has served as the dining hall. Fitzgerald Hall — is the location of St. John Manor, the residence for retired diocesan priests as well as lots of space for meetings, workshops, training sessions and retreats. It was named in honor of Bishop Edward Fitzgerald, the diocese's second bishop, who served from 1867 to 1907. 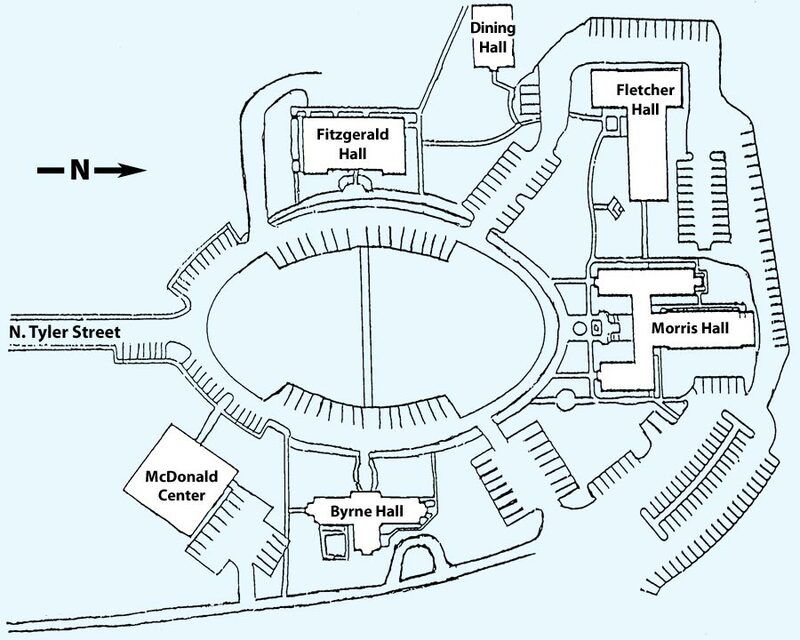 Fletcher Hall — offers dormitory-style rooms for overnight guests. Learn more about the accommodations or contact us to reserve a room. It was named for Bishop Albert Fletcher, first Arkansan to serve as bishop of Little Rock. He was bishop from 1946 to 1972. Morris Hall — houses the chancery and pastoral offices for the Diocese of Little Rock. It was named for Bishop John B. Morris, the diocese's third bishop, who served from 1907 to 1946. He is the reason the former diocesan seminary (now the diocesan offices) was named after St. John the Baptist. The McDonald Center —is the location of Catholic Charities of Arkansas, which includes the offices for the Alcohol and Drug Ministry, Catholic Adoption Services, Catholic Campaign for Human Development, Catholic Immigration Services, Catholic Relief Services, Parish Social Ministry, Prison Ministry, Social Action and Westside Free Medical Clinic. It was named for Bishop Andrew J. McDonald, who served from 1972 to 2000. Click on the map to get Google driving directions specific to your location.